Community Input: Was Ad Electioneering? Received from a reader. If someone can send along a PDF or even identify the issue we will provide a link or publish the information. 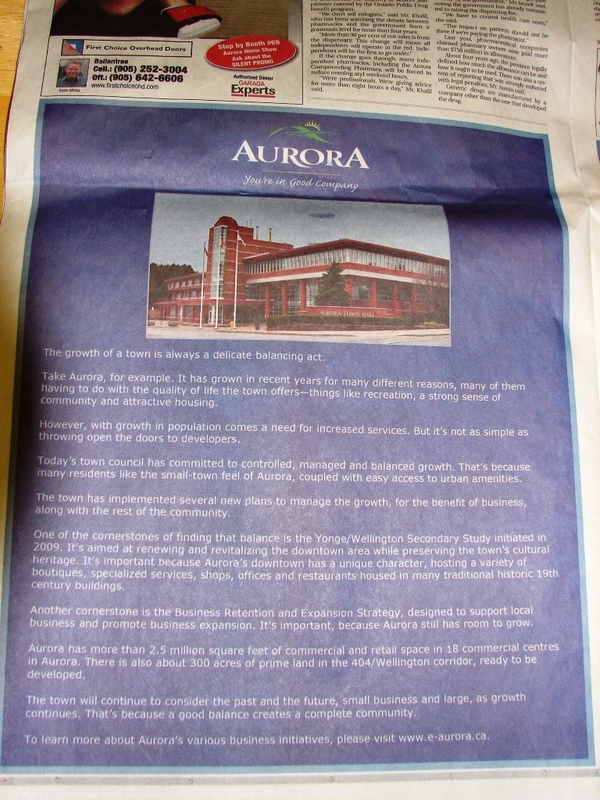 At tonight’s Aurora Council meeting, Councillor Buck raised some questions about a large ad in a recent Era-Banner issue concerning Aurora’s successes with economic development. I remember reading the ad since it was spread over 2 pages, although it would be about 1 page in total space. At the time it struck me as being a bit strange, since it didn’t seem to have a real focus and there were mistakes (though minor in nature) in it that I thought shouldn’t have slipped into it. From a marketing point of view it seemed to be put together in haste, though that’s just my personal opinion. When Councillor Buck mentioned tonight that she was raising these questions as she had concerns from other citizens and it had a flavour of “electioneering”, I thought I would like to take a second look. Unfortunately I didn’t keep my copy. 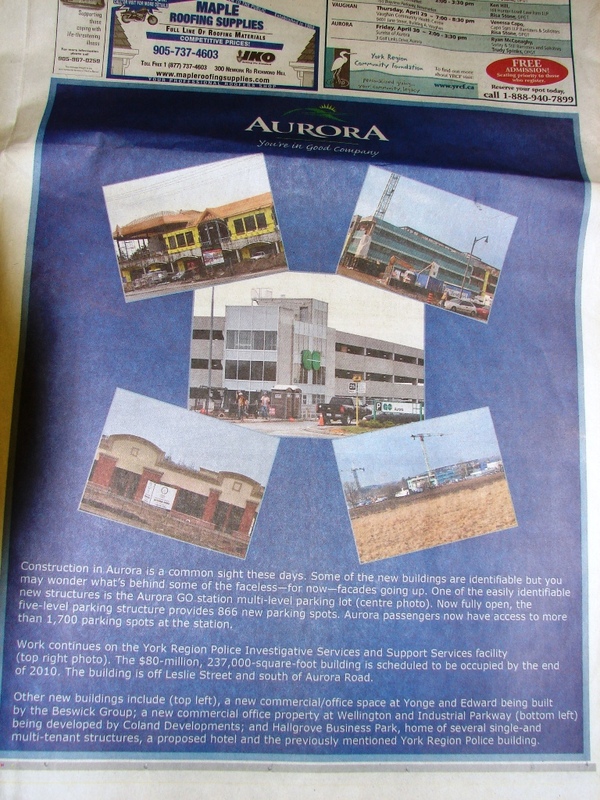 Would anyone connected with the Aurora Citizen still have a copy that they might be able to scan the 2 pages and provide it as a pdf file for 2nd reading? I unfortunately don’t know the issue date but I remember that it had a blue background and was on the lower half of each page with a number of photos of new construction. The following were supplied by a reader. The ad was published April 15. Click on image to view as larger size. This entry was posted on April 28, 2010 at 9:50 am	and is filed under Community Corner, Conflict of Interest, Election 2010, Town Council. You can follow any responses to this entry through the RSS 2.0 feed. You can leave a response, or trackback from your own site. Chris Watts has a good piece about a silly letter to the Auroran this week…. I started to say the ad was not inexpensive. Hopefully Phyllis didn’t bruise her lips blowing her own horn with this ad. If she and her cronies think I’m voting for them in October she can use those lips to kiss my ***. When that time comes it is extremely important that anyone who asks questions at an all candidates is direct and calm. The advantage is to the person who has the microphone if there is a clear question,and tone to go with it. Once emotion is put into it by loud or mean spirited direction, the edge goes to the candidate. Putting someone on the spot is gained by control. Control in voice and body language will put the person off guard. They cannot read you, but you in that, put them on the spot. Those(candidates)who have poor skills at the mic beware. Citizens practice for that day. It is hard to public speak for 99% of the population. If more people get at the mic and are prepared ……look out. It could be a very bumpy ride for some seeking office. The All Candidates meeting really can be A.S.A.P. We know there are at least a couple of present members of the local political scene who will seek re-election. The time is actually now to take the podium(or microphone)at the Town Hall. This is the best way to let those who intend to lead us that they will be confronted with questions for all to hear,now and moving forward. It is kind of like the old Network movie with Peter Finch. That is how Aurora may be shaping up. That is really hard to defend against, as I said. A rant and barbs usually go from the podium with heads shaking in the crowd. It has not worked for some in the seats of the chambers. If rope is in short supply, any chance a clothesline might be available? I could not agree more but no one should under estimate the fog machine that the Mayor has at her disposal. I can assure you that she really does believe that she is a noble crusader and she is COMPLETELY BLIND to the duplicity and incompetence that she has demonstrated so often. Phyllis honestly believes that she has restored integrity and transparency to our local government, while making “informed” decisions (I use that word lightly) and creating a constructive and positive working environment at the town hall. What she has really done is ignored the facts as often as not, while racking up unnecessary or highly suspect legal bills. She has allowed staff to be treated like crap and as for open and considerate dialog… forget it ! Phyllis lives for a good fight because she ALWAYS needs an enemy to deflect from the fact that she is actually insecure and often scrambling to figure out what is going on. I realise that now. Phyllis will not back down, even in the face of overwhelming facts and logic. At the end of the day, our current Council seems to feel that it is not as much about doing what is right as much as it is about doing what appears to be right while serving the Mayor’s purposes and propping up her self image. I highly suspect that this is going to be a nasty and brutish election season; full of smoke & mirrors and the occasional cloak & dagger. I think considering we are in the last weeks of a four year term, these ads appearing now have the very real perception of promotion. But the Council not the Town. Council did not authorise the ads. I think the amount of business the Town give the Banner is reflected in positive coverage The Banner gives The Mayor.No-one is unaware of the mayor’s mercurial disposition. Of course it could never be proven. But it only makes good business sense. The business of the publication is advertising. A business that doesn’t take car of it’s best client would not stay in business long. Advertisers have always influenced news content in newspapers Why wouldn’t they? It is inexpensive advertising if the taxpayers paid for it instead of the GOS. Thw Auroran issue with the ad was April15th It was on two pages each more than half a page and several colours. that is expensive (revised by moderator per comment from author) advertising. It read to me like electioneering on on the Town’s dime. The only thing missing was an image of the Mayor. Council, cot the whole council at any rate, did not authorize the ad.That was the Chief Administtrative Officer and he did not know the cost.I guess it doesn’t matter when it’s public money.being spent. I think when going forward with plans to “correct” the official record, the Councillors might be wise to have actual documentation on hand to prove their points. Otherwise, it’s just he says ,she says.Committee membership is all that’s needed to tell the story. Evelyn, you said “that is inexpensive advertising”… I trust that you meant “that is expensive advertising”. Based on the rate sheet I saw for a single run of a half page, the cost would be between $2,300 and $4,200 per ad, depending on the day it runs. I’m not sure if that covers multiple colours. That said, I suspect the town gets a significant break on the posted advertising costs given the large volume of ads it buys, but you are still looking at thousands of dollars in total cost for the two half pages. According to the rate sheet, for ads bought in volume you could be looking at a cost of $1,660 to $2,800 per half page ad. We should also keep in mind that the town is spending this kind of money to promote the town to people who already live here, so I trust they are also running ads in other target markets as well if the idea is to attract new business to the town. Good point, Richard. An ad to promote the town to people who already live here = electioneering! I would love to see a “spell check” feature as well as an edit option on this site. Of course I meant to say… “the town is spending this kind of money to promote the town to people who already live here”. Spell Check is not offered through WordPress — but we have made the correction as requested. It was The Banner not The Auroran. The cost was $3,700 exclusive of GST. That makes it in excess of $4,000. What caught me about this debate was the Mayor’s somewhat smarmy response to a question posted by as fellow Councilor. The Mayor sounded very much like she was electioneering and taking jabs at Councilor Buck when she congratulated staff for doing such a great job of selling Aurora given that “advertising pays” after all, and then on a following issue before Council she proceeded to have numerous slides put up for all the to world to see, while she slammed the dilapidated state of the downtown core at Yonge and Wellington while attacking the land owners; one of which was apparently trying to sell his property for redevelopment and one who had pending plans for redevelopment coming before council. She repeated how concerned people were of taking their babies beside a building that appeared to be falling down, despite the fact that staff had just informed her that the structural integrity of the building was not in question. Bricks were not in fact falling on people and there was never any such risk, but the Mayor persisted in her perceived valiant effort to save people from the non-existent dangers posed and the terrible land owners in question. It struck me as a strange way to sell the downtown core and the beauties of Aurora while working with local business to make necessary improvements, but at the same time it was totally consistent with the Mayor’s approach to solving problems. There clearly are issues to be addressed here, but just maybe the Mayor’s approach would be more effective if it were more subtle, constructive and well informed, but we know from experience that is not likely to ever happen. Consistent with the Mayor’s approach to local government, which seems to be based on the notion that “if you not with me you’re an evil doer”, it should come as no surprise that shortly after the above noted attack on her fellow Councilor, the state of Yonge and Wellington and local land owners, Councilor MacEachern and Councilor Gaertner then proceeded to both take what appeared to be additional pre-planned pot shots at Councilor Buck while they agreed with the Mayor that going forward the official record should be corrected whenever required. Don’t get me wrong, I have no problem with the truth, but we can only hope (and highly doubt) that the new rules will be applied to all concerned at council in an even handed fashion. As far as Aurora Council is concerned, I think that the problem is not as much in the details, as it is in the whole approach.